The Spada 2000 is an all-weather, day and night, low-to-medium altitude air defense system (LOMADS), developed by European-Based MBDA Missile Systems. The Spada uses Aspide 2000 SAMs, which use a proximity fuse to detonate its fragmentation warhead. 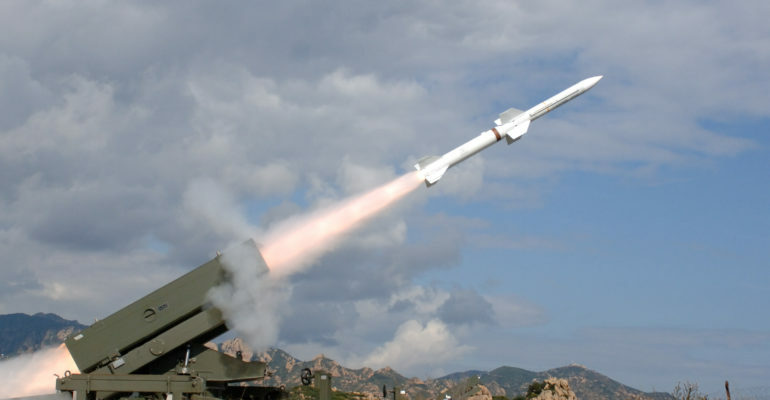 [i] Aspide 2000 missiles have a range of about 25 km and can intercept incoming projectiles like hostile aircraft before they release stand-off weapons. [ii] The system has a radar with a 60 km range and is able to track up to 100 targets at the same time. [iii] Additionally, the radar is electronic countermeasure (ECM) resistant. The Spada is also road-mobile and interoperable; it can coordinate with up to 10 VSHORADS within a 10 km radius. [iv] The Spada 2000 system consists of a detection center and either two or four firing sections. Each section is equipped with two missile launchers which have six ready-to-fire Aspide 2000 missiles.